I guess if I say I'm still printing it won't come as much of a surprise, but just look at how many different ways I can cross things off one list. Luckily the second page has less on it. I've also been slowly building up the other bits and pieces that I hope will go into this, and at the moment my piles look like this. Before I started, what I had in my head was a bit like this: the printed strips interspersed with water-y hsts. But as I printed and printed I started to wonder if it might be more interesting to add in an extra element, like this. As you can undoubtedly tell, nothing is sewn here, bar the lighthouse. I am just laying bits out on the floor to give a feel of what I've been thinking. Of course this means that once I start proper piecing everything may change, but this is where my head is for now. I added the feed sack quilt to the links since it is an improv utility quilt and it has lettering on it. Maybe I wasn't suppose to start a new quilt with lettering because this one was coming my way. Hooray - another evolutionary version of your free pieced lighthouses!! Watching to see where you go with this! I like the way you are not only thinking out loud, you are thinking with pictures. I need to actually start from scratch instead of depending on a pattern for the inspiration. Love your lettering style. So unique to you! The triangles are already starting to tell a story as well! Robin said it so well; you are thinking with pictures. I like the the way the lighthouse breaks up the printing and the waves. Great perspective. Ooh, I like the blue HSTs, very nice. Kaja, I have grown fond of checking in on your deliberations. They always result in another quilt that is thoughtful, whimsical and beautiful. Reading your posts along the way reminds me that it will come, if it is given time, a good lesson for impatient me. For some reason, the words thing hasn't struck a chord, though I've given it some thought. It is in the "idea file". Just had other irons in the fire lately. Let's just say I've taken the summer off, shall we. I'm glad Kaja and Ann are still her to prompt us. I've added a second link to share the finished quilt top for Words to Live By . . . on to the scrappy wordy back next. I had never even heard about a shipping forecast before you mentioned it so your quilt has enlightened me. And I like the addition of the lighthouse. There's wonderful stuff going on in this quilt. OK, this project is just so COOL! You know how much I love your lighthouse quilt. I was so happy when you told me that you were planning another lighthouse block. It's just as fab and I can't wait to see what you did with it. Is the gold a bit of leftover fabric from the purple quilt? It looks like it might be. 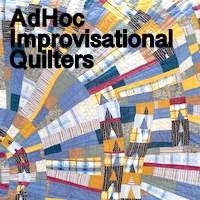 I hope the quilt I shared isn't one I've posted on AHIQ already. #25! You girls have been hosting AHIQ for a while! Well, this quilt is keeping us all in suspense. I like what I see so far. And if there is a lighthouse on a quilt, I'm all in.